After over two years in the making, tomorrow night sees one of the most anticipated fights in many years. David Haye, the brash and arrogant WBA Heavyweight champion, takes on the younger of the two Klitschko brothers, Wladimir, who have dominated the heavyweight division since the retirement of Lennox Lewis, way back in 2004. David Haye has made it his ambition to unite the heavyweight division ever since moving up from cruiserweight three years ago. His outspoken personality has talked his way into this fight and he has not been afraid in trash-talking his Ukrainian opponent. 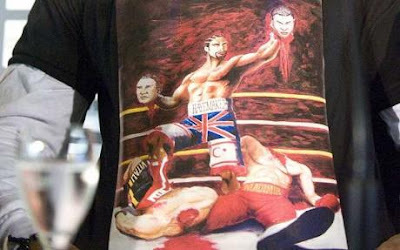 From T-shirts showing Haye holding the decapitated heads of the Klitschkos to talk of Klitschko being carried out of the arena in an ambulance, he has not been afraid to talk up his chances. However, inside, he will know that this is the biggest test that he has faced in his ten year professional career. It is not through luck that Wladimir Klitschko has held the IBF and IBO Heavyweight titles since beating Chris Byrd in April 2006. He has defended those titles nine times, winning seven of them via knockout. Wlad is a highly accomplished fighter and deservedly starts the fight as the bookmakers’ favourite. In a way, there are many similarities between this fight and one of the last great heavyweight fights. Ten years ago, Lennox Lewis took on Mike Tyson at the Pyramid Arena in Memphis, Tennessee. The fight saw the big man – 6’5 reigning champion Lennox Lewis – taking on the smaller, quick and powerful man – the previously almost unstoppable Mike Tyson. Whilst Mike Tyson was clearly past him prime by this stage, the starting odds with the bookmakers were around 6/4 – virtually the same as the starting odds on David Haye. The fight itself saw Lennox Lewis mechanically using the jab to keep Tyson at bay – indeed, despite his success, Lewis was often accused of having relatively dull fights as a result of his ruthless efficiency in doing enough to win without allowing his opponent a chance. Many of the same things have been said about Wladimir – his jab is one of his main weapons, which combined with the reach advantage that he will have over Haye will prove troublesome for the British fighter. Another interesting parallel between the two fights is that Lewis’ old trainer, Manny Steward, will be in the corner of Wladimir Klitschko, who he has been training since 2004. It would therefore not be surprising to see the Ukrainian using many of the same tactics that Lewis used. However, one aspect where Wladimir trumps Lewis is in sheer power. Phil Jackson fought both Lewis and Klitschko and admitted that Wlad has significantly more power in both hands than Lewis had. David Haye, with his cruiserweight roots, is set to be one of the fastest opponents that Wladimir has ever faced. However, he combines this pace with power, particularly in the right hand. 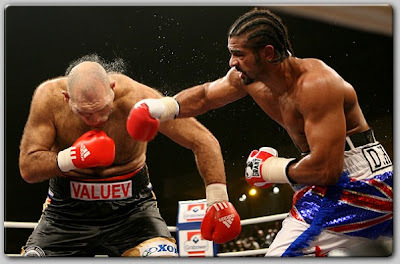 Haye’s best punch is the overhand right, which he will be looking to use to knock his opponent off his stride. However, Haye has a tendency to lunge forward a bit with the right jab, often lacking power, and there is a suspicion that he could be vulnerable against the right jab of his opponent – a weapon that Klitschko certainly possesses. The other worry for Haye is the left hook of Wladimir – a punch that he rarely uses, but it is the most dangerous punch that either of the two possesses. If Haye is caught lunging forward with the jab or looking for the big punch, he is likely to get caught at some point and his chin will be put to the test. The other potential concern over David Haye concerns his fitness and stamina. He has only ever had to go the full twelve rounds twice – once was against Nikolay Valuev, where he was hardly forced to fight every minute of every round. He will certainly have to do that if this fight goes all the way. Indeed, it is questionable whether Valuev would even be close to championship level were it not for his sheer size. Haye eventually only won that fight on a majority decision – he will have to up his game significantly to even stay close to Wladimir. 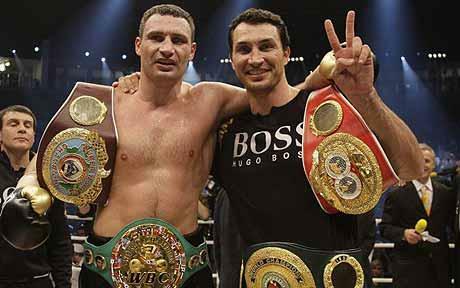 As well as his impressive professional record, Wladimir also possesses a highly accomplished amateur record. Whilst David Haye is a former silver medalist in the World Championships, Wladimir is a former Olympic gold medalist at Super Heavyweight level in Atlanta 1996. His amateur pedigree shows that he is a very talented boxer, even if he is not the natural fighter that his brother is. Despite all of the taunts, sometimes quite personal in nature, from Haye, Wladimir has remained relatively composed throughout the hype for the fight. Unsurprisingly really given that Wlad has always been known as the nicer brother and far more mild-mannered than his brother, who you would not mess with unless you were surrounded by your own people (he has been known to brawl in the halls of the Ukrainian parliament against pro-Putin factions within the government). Whether Wladimir’s relaxed approach to the fight comes from his nature or simply a supreme confidence in his own ability remains to be seen, but come tomorrow night in the ring, the laid-back approach will disappear and Haye will be up against the biggest test of his professional career. This is the fight that will either set the foundations for an epic unification battle with Vitali or show Haye up for the over-confidence fraud than many have suggested. Personally, I struggle to see how David Haye will be able to deal with the power of Wladimir and the superior height and reach advantage that the Ukrainian possesses. He will have in the back of his mind the fact that if the fight is close, the judges in Germany are likely to favour Klitschko, but if he goes jumping in trying to fulfill his promise to knock out his opponent, he will leave himself open to the big left hook and may find himself on his back in the middle of the German ring.